Being the father in a family of traveling surfers, the most natural “family bonding time” seems to be taking a surf trip. So when my wife and I had our third child in November, we decided we were going to take full advantage of the paternity leave offered through my company and the state of California with an extended trip across the Caribbean, Central and South America, and Australia. As you can imagine, I was pretty stoked when our newest daughter was born and my wife suggested I spend the first two months getting everything organized at work, setting us up for the opportunity to take an extended trip once she’d fully recovered from delivery. We have been taking family surf trips since my kids were a few weeks old, so this adventure wasn’t completely new to us. But now with a four-year-old, a two-year-old, and a two-month-old, we are outnumbered. In our experience, three kids are way more hectic than two. We decided that the first half of our trip would be in the epicenter of Dominican surfing at Playa Encuentro. We wanted to see how easily we could get all three of the kids out of bed, lathered up in sunscreen, fed, and out the door in a relatively short time frame. And that’s why we decided to stay at a surf lodge directly across the street from the waves, which turned out to be a perfect choice. It quickly taught us how important convenience is while trying to keep three kids younger than five years old in control. 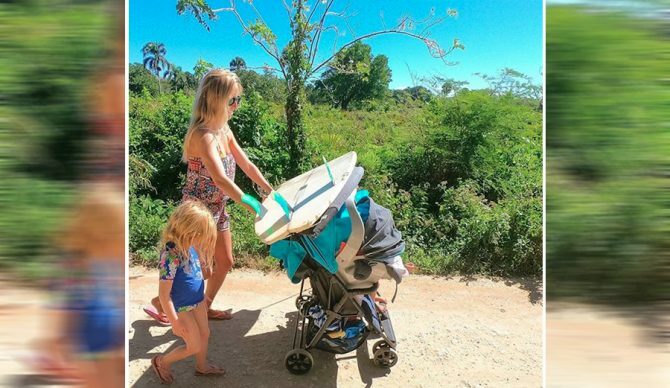 We turned our double stroller into a makeshift surfboard carrier and walked right across the street to surf every day. A lot of the locals would honk and throw shakas as they drove by in support of our efforts to haul three kids, four surfboards, and two backpacks to the beach. Not only did we feel like a traveling circus but apparently we looked like one too. As for the surf, Playa Encuentro had waves every single day, from a few feet overhead to waist high. Suffice it to say, we scored on all fronts for our family of five. We had to rely on some local help through the second half of our trip. Once you go northwest of Puerto Plata (which is near Cabarete), there’s a three-hour stretch of coast toward Haiti that is rugged, isolated, and rarely surfed. Outside of Cabarete, there are nearly no surfers. We wanted to see more of the DR and surf places by ourselves, so I got in touch with The Search DR, a group of locals that have been surfing these isolated spots for years. Because we still wanted the convenience and ease we’d found at Playa Encuentro, they recommended we make our base at The Senator Resort which has three point breaks within a few minutes of the hotel. The all-inclusive aspect was nice because the convenience of not having to leave to eat helped offset the travel time to get to the nearby waves. They took us to spots that aren’t on the map and they helped us navigate some pretty gnarly setups. As the first leg of our trip winds down, we’ve already learned a lot about traveling with three young children and are looking forward to enjoying our remaining time in the Caribbean. Follow the Denning family trips on Instagram here.